Bestselling author Judy Belmont has created another treasure chest of hands-on and easy-to-use handouts, activities, worksheets, mini-lessons and quizzes that help clients develop effective life skills. 150 More Group Therapy Activities & TIPS, the fourth in her Therapeutic Toolbox series, provides a wealth of psycho-educational ideas with Belmont’s signature T.I.P.s format ( Theory, Implementation, and Processing ). Judith Belmont, MS, LPC, is a psychotherapist, consultant, mental health author and motivational speaker. She has spoken nationally as a workplace wellness speaker as well as a continuing education presenter for PESI. She focuses on psychoeducation and practical life skills. 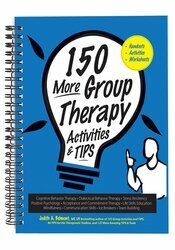 Her books include 150 More Group Therapy Activities & TIPS, 103 Group Activities and Treatment Ideas & Practical Strategies, 127 More Amazing Tips and Tools for the Therapeutic Toolbox, 86 TIPS for the Therapeutic Toolbox, The Therapist’s Ultimate Solution Book andEmbrace Your Greatness.